I’ve always been a clothes junkie. The habit started then, and it hasn’t stopped all these years later. Twelve years ago, I decided I wanted to be Stacy London of What Not To Wear and became a certified fashion consultant. A part-time job I did for a few years until I became a full-time professor, I helped women shop for clothes and dissected their closets. We built new wardrobes or altered existing ones. One particular woman had just given birth to twins and was re-entering the workforce, and her size had changed. In one morning and with $500, we built her a new business wardrobe. She hugged and kissed me, thrilled that she had the beginnings of a brand new collection that took into account her adjusted size. She looked fantastic. And I was thrilled to have helped her. It’s not the most flattering photo of either of us, but here’s Stacy London and me at the Believe in Tomorrow fundraiser in Baltimore from a few years ago. She liked my dress. 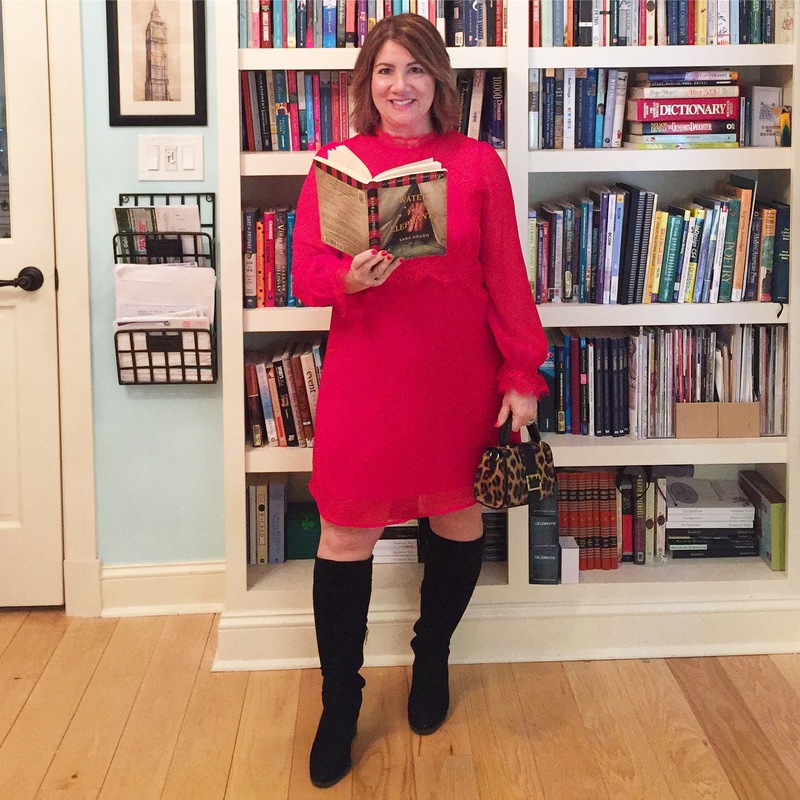 Finding your own sort of style is important, and wearing clothes that make you feel good should be the priority when shopping, while also trying to find clothes that suit your body type. In fashion workshops I developed, I talked about body type a lot, because the cut of the clothes can definitely help your body type, build, and height. As a petite person, I have to watch that clothes don’t overwhelm me, that prints are not too large, that ruffles are in proportion, and that I pay attention to my curves and work with them, not against them. (I curse them sometimes, too, but I have to remember, they can be my friends). Be patient with yourself—love yourself—and believe that you can look smashing with a little effort. I know this to be true having shopped with many women over the years and having helped people who thought they were hopeless or distraught about their weight or shape realize, in fact, that they were downright gorgeous, and that perhaps they were just not wearing the right colors or cut of clothes. It’s all about proportion in the end; and remember, all shapes and sizes are beautiful. And that’s what’s kicking off this first installment of The Petite Professor. I hope you will enjoy this weekly segment. 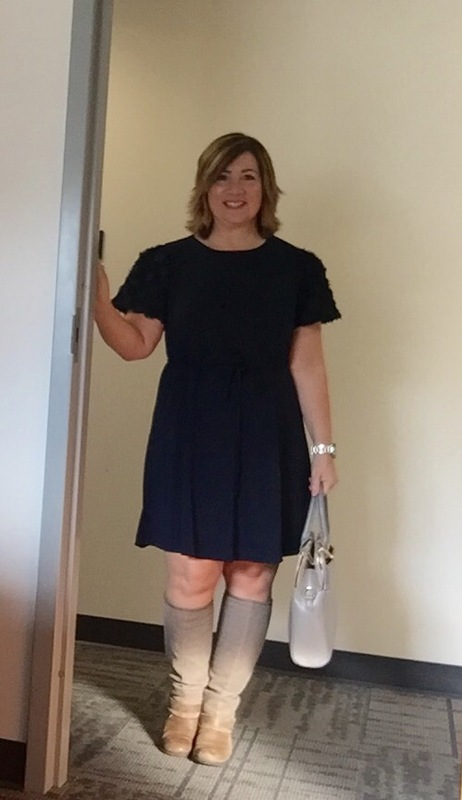 Navy Blue Dress: Ann Taylor Loft; Boots: Nine West; Briefcase: Lulu’s.